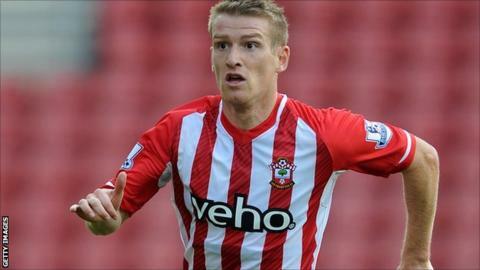 Southampton: Steven Davis says transfer window "unbelievable"
Davis says Southampton's players "want to settle down and concentrate on our football and win some games"
Southampton midfielder Steven Davis says the players are now fully focused after an "unbelievable" transfer window. The likes of Rickie Lambert, Luke Shaw and Adam Lallana all left this summer but eight replacements were brought in. They included the deadline day arrivals of Sadio Mane and Toby Alderweireld. "It's been an unbelievable transfer window, I don't think anyone could foresee what was going to happen," Davis, 29, told BBC Radio Solent. "From outside there were questions marks about the direction of the club, especially as we lost a number of top performers from last season. "To be fair to the board, the manager has been backed and it's been a good transfer window for us. "We just want to settle down and concentrate on our football and win some games," he added. Along with Mane and Alderweireld, Southampton also recruited Graziono Pelle, Dusan Tadic and Shane Long. Davis says he is optimistic about the future. "With another couple of additions the squad is looking really strong now," he added. "There is competition for places and you have to be right bang at it to stay in the team and that can only be good." Boss Ronald Koeman, who replaced Mauricio Pochettino in the summer, admitted it was a challenge to reshape his squad in a short space of time. "It was a strange summer because we had changes but now we know our squad," he said. Koeman says goalkeeper Artur Boruc, who was expected to to leave St. Mary's this summer, must now focus on trying to win his place back after losing his spot to Fraser Forster. "I spoke to Artur and the best situation for everybody was if he played in another team," said Koeman. "That was not a possibility for him and he is a player of Southampton and has to bring the spirit to the team and maybe I will change."